After my dad immigrated from Wales to the US, there were two things my dad always asked my mom to make at Christmastime that represented home for him. One was a mince pie which he couldn't get enough of, and the other was a nice Christmas Pudding, or pud as he always called it. I probably haven't had a Christmas pud since my dad passed away, but even though I never really developed a taste for it, I still miss it at the holidays. In fact, I miss all the steamed puddings my mom used to make for us, but, alas, I never felt very drawn to making any myself. 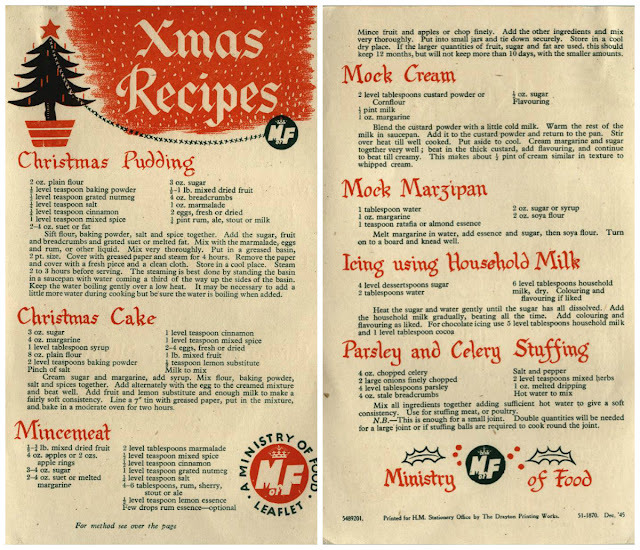 So I found myself pleasantly surprised when I was going through my Food Facts file for my first post on Victory Through the Ministry of Food prompted by my review of The FitzOsbornes at Way by Michelle Cooper, to find that I had saved a number of saved articles on Christmas puds. 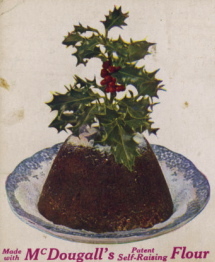 My favorite is the gay Ministry of Food leaflet for a Christmas Pudding from 1945. The war had officially ended in September1945, but rationing was still in effect. However, by Christmas, some things were finally more plentiful and so the Ministry of Food published this leaflet especially for that first peacetime Christmas to help make the holidays somewhat nicer than they had been for the past six years. But despite the appearance of improved conditions, Christmas 1945 wasn't quite what it could have been. Granted the blackout was over and bombs were no longer being dropped, but promised shipments of foods failed to meet expectations. According the news reports, of the three shiploads of oranges that were due to arrive, only one ship made it to port and most of the oranges were bad. Christmas turkeys, which couldn't be stuffed anyway, were available, but mostly on the black market at outrageous prices. Shipments of wine and alcohol also didn't come through. But large gifts of toys, plum puddings and sweets were sent to Britain from Australia, South America and South Africa, so that Christmas 1945 was not without some treats. And of course, the biggest and best Christmas present of all that year was the end of the war. 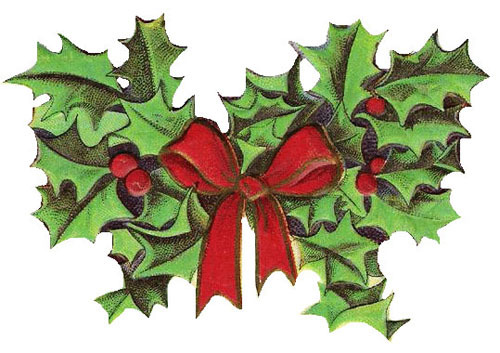 To everyone, a very Merry Christmas and a Happy New Year! Some years I make a pudding..this year I just made my Christmas Cake..an alcohol laden fruit cake with a good deal of marzipan. Well, an alcohol laden fruit cake sounds good, especially with marzipan. Christmas pudding or fruit cake both make for a Merry Christmas, I think. I don't think I've ever had a Christmas pudding. Interesting. Does it stand up? Not sure. Always wondered about figgy pudding in the song. Wonder what that tastes like? Yes, it does stand up, probably because of the alcohol in it. I think figgy pudding is about the same as a Christmas pud. Christmas pudding is good, but I think an acquired taste. Merry Christmas to you! We always have plum pudding (flaming!) and hard sauce for Christmas Day dinner at our friends' house. I've never made one myself, though. 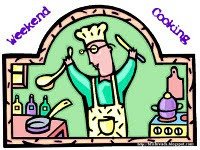 Merry Christmas to you, too and thank you for hosting Weekend Cooking. I remember plum puddings on occasion. I used to like the hard sauce more than the pudding, but haven't had it in a while. Funny how you keep some traditions, but not others. I've never had Christmas pudding, thanks for sharing this interesting bit of history and Merry Christmas to you. Merry Christmas to you, too and I am glad you enjoyed to history bit. I like to include interesting pop culture information in the same time frame as my book posts to try and give a well rounded view of things. I have always wanted to try making a steamed pudding, but have never gotten around to doing it. My daughter loves baking now, so maybe we should try one while she's on Christmas break. Interesting history. I feel sad for all the people who were hoping for a Christmas orange that year. We made figgy pudding a couple of times just for the fun of it and really quite liked it. Merry Christmas to you and your husband. When my dad came to this country, he craved oranges, now I know why. I imagine making a pudding with others is a lot more fun than doing it alone, but unfortunately no one in my house is interested. I'm pretty sure I've never had Christmas pudding. I hope you had a good Christmas.